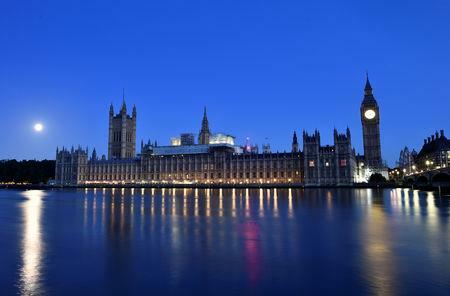 LONDON (Reuters) - Britain's 800-year-old parliament has a big decision to make, and little time to make it. After months of drama and delay, the country's fate could be decided next week in a series of Brexit votes in which lawmakers must choose one of two wood-panelled corridors to shuffle down inside the neo-gothic Westminster palace. Each vote, known as a division, takes about 15 minutes. If it takes too long, the Serjeant-at-Arms, dressed in shiny black shoes, knee-high socks and a long woollen suit, will be sent bearing a ceremonial sword to investigate. Rich in pageantry and theater, Westminster's parliamentary format has been adapted, modernized and exported to more than two dozen countries across the globe. 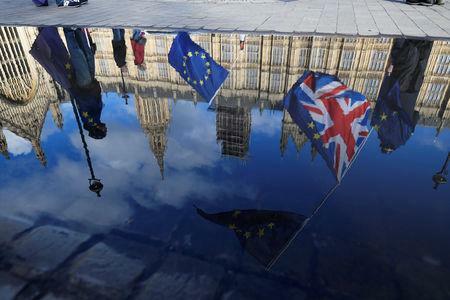 But with less than a month until Britain is due to leave the European Union on March 29, the largely unreformed template is struggling to deliver on a deeply divisive decision that has shattered the traditional left versus right party loyalties. After almost two years of grueling negotiations by Prime Minister Theresa May's government, parliament resoundingly rejected the exit deal she struck with Brussels and lawmakers across parties are now fighting to dictate what happens next. The battle is playing out inside a building whose crumbling 19th century limestone exterior matches an interior where Brexit is eroding a party structure that has defined British politics for almost a century. "There's now a live battle between the government as the executive and the membership of the parliament about who has control," said Pete Wishart, a member of parliament from the Scottish National Party. On March 12, May is expected to try once more to get her deal approved, though much will rest on whether she can secure extra assurances from Brussels about the thorny issue of Northern Ireland's border. If that vote fails, May will ask parliament a day later whether it wants to leave the European Union without any kind of exit deal - a potentially disruptive divorce with damaging consequences for the world's fifth largest economy. If parliament rejects that outcome as well, lawmakers will then decide on March 14 if they want to try to delay Brexit, potentially opening the door to a wholesale renegotiation with the EU - or even a second referendum at home. If the process does go to a third ballot, when Speaker John Bercow bellows "Division!" and bells ring across parliament and beyond to alert lawmakers to the vote, Britain could be 15 minutes from taking its first step towards reversing Brexit. "This is the first time the public decided in a referendum something that was not what most members of parliament were in favor of - that is this challenge we're having - this is the argument between government and parliament," said Mark Harper, a lawmaker with the ruling Conservatives and former minister. The fact the outcome of the Brexit votes next week is still highly unpredictable is symptomatic of a parliament built on the principle that the majority rules. The 2016 decision to leave the EU fractured Britain, dividing families and communities, cities and villages. In parliament, where many struggle to accept the 52 percent to 48 percent result, there's no clear consensus on the way forward. In the 650-seat House of Commons, May is shy of a majority, meaning she can only govern and pass laws with the support of 10 allies in Northern Ireland's Democratic Unionist Party (DUP). But the DUP and a eurosceptic faction within May's Conservative party don't support her current Brexit deal and they joined opposition lawmakers on Jan. 15 to reject it and inflict the biggest defeat in modern history. Since then, May has been buying time by promising to report on progress in EU negotiations on a fortnightly basis, while lawmakers across parliament concoct plans to break the deadlock. The Malthouse Compromise, The Brady Amendment, The Cooper-Boles Bill: not a trilogy of airport thrillers, but eponymous attempts by lawmakers to use complex procedures and processes to end the parliamentary impasse. 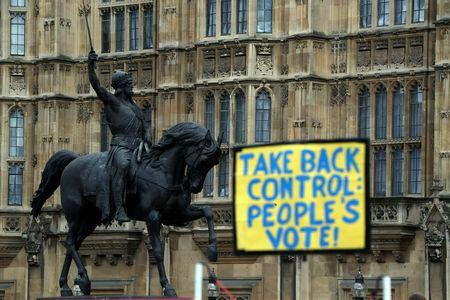 Some say a second referendum is now the only way out, though critics argue that a so-called People's Vote would destroy faith in democracy - given the country already voted in 2016. Despite the ticking clock, key legislation needed to prepare for Britain's exit is on hold while lawmakers fill the hours between May's updates with general debates on unrelated topics such as "Sport in the UK". On one day in February, the five-foot-long ceremonial mace that is laid in the chamber to mark the start of each day's proceedings, was lifted after just four hours to draw business to an early close. Outside parliament, frustration among voters on all sides is growing with a system seen by many as opaque, incomprehensible and flunking the biggest decision of their lifetimes. "A lot of the language of parliament - Henry VIII powers, statutory instruments, public bill committees, select committees - this language is quite impenetrable to ordinary people," said Ruth Fox, director and head of research at the Hansard Society https://www.hansardsociety.org.uk, a pro-democracy charity. "If I were asking ordinary people in most towns and cities across the country what a bill was they would think about it in terms of their own bill for their electric or for their gas - rather than a piece of legislation." A 2018 poll by Ipsos MORI https://www.ipsos.com/ipsos-mori/en-uk ranked politicians as the least trusted profession in Britain after advertising executives. Government ministers, estate agents and journalists made up the bottom five. "It's just all these old men sitting around in an old building," says Terry Clare, 34, a plumber in east London. "It just seems like a bit of a show." But regardless of the final outcome, the Westminster system has had a profound impact on the Brexit process. The so-called meaningful vote on May's Brexit deal in January only had legal weight because lawmakers demanded it. The government has also been found in contempt of parliament and forced to produce legal advice it wanted to keep confidential. And, crucially, next week's votes are only happening because May's team knew that if they didn't offer them, ministers were ready to resign and back a rebel plan forcing the same outcome. "In my 18 years here it's probably one of the most engrossing battles I've ever witnessed," said Scottish lawmaker Wishart. "It looks like the house is winning just now."